infoVantage integrates seamlessly into MAGIQ Documents to create a smooth and continuous experience. Because infoVantage is web based, it is easy to deploy across your entire organisation. A central repository that provides guidance and rules to all staff for how recordkeeping is done in your organisation. Allows your end users to easily contribute to your records and information knowledge base. Design and build the custom aspects you need to manage the business rules around your information. Using the infoVantage search, users can easily find all the documented information for your recordkeeping system. Use infoVantage to build a corporate thesaurus for your organisation. What is a "Custom Aspect"? Each organisation is unique in the way that they manage their information. While most follow similar principles, there will always be some aspects of their information that one organisation will see differently to another. Because of this, we have designed infoVantage to be highly customisable. 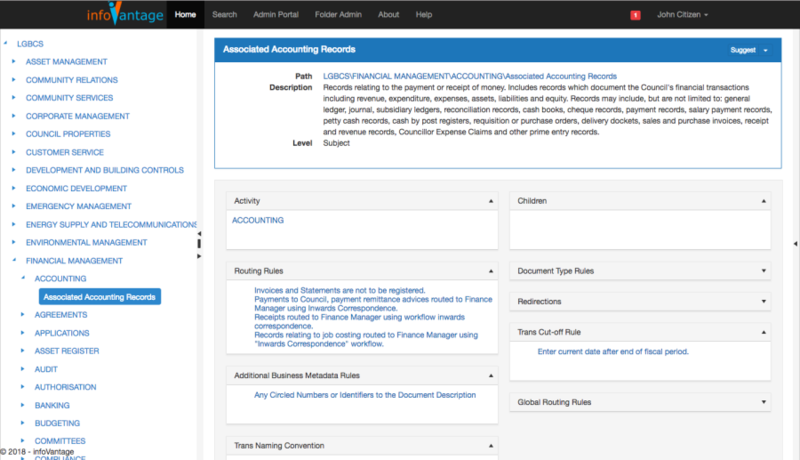 Custom Aspects represent the metadata needed to successfully manage and maintain records and other information. You can create an unlimited number of Aspect Types, such as a Routing Rule, Naming Conventions, Document Type, etc. and customise the fields that are required for each Custom Aspect Type. With this freedom, you can customise infoVantage to view every aspect that you need for your information . How do users collaborate to build the knowledge base? Building a knowledge base to support the Records and Information Management function of any organisation is a formidable task. Those with the responsibility to manage information assets can’t do it on their own. Everyone needs to contribute to the knowledge base and the infoVantage Suggestion and Approval process provides an easy to use, built in interface that allows end users to suggest additions to the knowledge base that can be vetted by administrators at the click of a mouse. What systems does infoVantage integrate with? CorpMem specialises in MAGIQ Documents and we have built infoVantage to integrate with this amazing eDRMS. Where can I send my enhancement requests to? If you have a change that you would like to see added into infoVantage, send an email to info@corpmem.com.au. © 2019 CorpMem Business Solutions. All Rights Reserved.